This time of summer, we can look with satisfaction out over the horticulture plots’ “green fallow” of warm-season cover crops, keeping the soil shaded and sheltered, as well as weeded and nourished, despite the hot, dry weather. Two new labeling programs reward farmers and ranchers for just such conservation-friendly practices. Perhaps one would be a good fit for your operation? 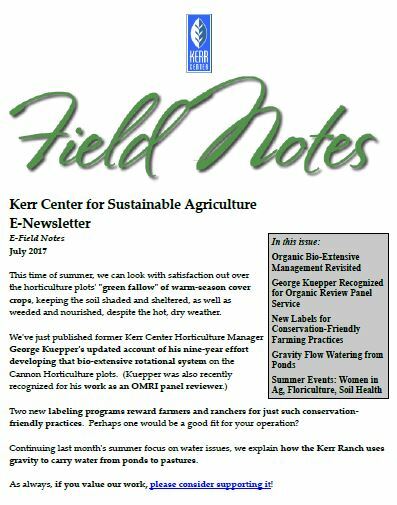 Continuing last month’s summer focus on water issues, we explain how the Kerr Ranch uses gravity to carry water from ponds to pastures. Oklahoma and the Monarchs: Lend a Hand!